Manayunk is a great neighborhood in Philadelphia for eating and drinking. In fact, the word Manayunk itself comes from the Lenape Indian word for river – Manaiung – which literally means “a place to drink”. Most people only associate Manayunk with the long stretch of restaurants and bars lining Main Street, but there are lots of hidden gems up in the hills as well if you’re willing to make the trek. Luckily, I live at the top of the hill, so navigating my way to the Old Eagle Tavern this week wasn’t so hard on the knees. While from the outside it may look like your typical neighborhood “Old Man Bar”, inside it – well, ok, it kind of looks like your typical neighborhood Old Man Bar – but without the musty smell or smoke-filled air. The draft list and menu are also a far cry from what your Uncle in the suburbs is probably sitting around looking at as well, as the place is owned & operated by the same folks who run Devil’s Den and the Barren Hill Tavern & Brewery. Since I’d given the burger at Devil’s Den a try before, I figured I’d see what the Old Eagle Tavern had to offer. 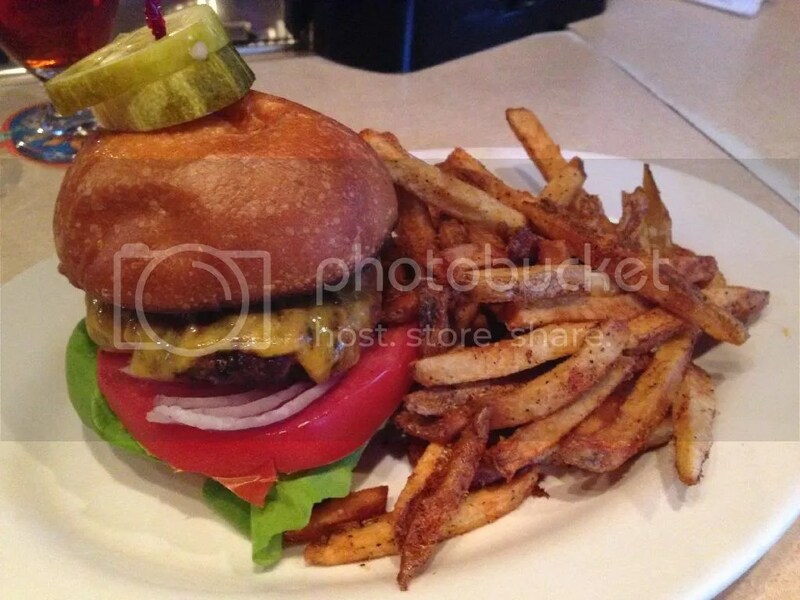 The burger was a simple, no-frills bar burger, topped with cheddar, red onion, bibb lettuce, a HUGE slice of a beefsteak tomato & pickle slices. I ordered the burger medium & it was cooked perfectly pink all the way through, with a nice grilled char on the outside. The patty was a little on the small side, so I was worried that I would run out of meat before I ran out of bun, but I somehow managed to make it through to the end with a good burger to bun ratio left. I think it may have had to do with the bun being super light and airy. I got a lot of bread in the first few bites, but it wasn’t as bread-heavy as some other buns so it didn’t make me feel too full; I was happy about that. All in all, it was a really nice, solid bar burger. Paired with a beer list that includes gems like Weyerbacher’s Heresy & Barren Hill’s own Biere de Extra, this definitely ain’t your Uncle’s local watering hole. I’m just upset that this place has been in my neighborhood all this time and I only just found out about it! Posted in bar burger, Barren Hill Tavern, beer, buns, burger, burgers, Devil's Den, Manayunk, medium, neighborhood bar, Old Eagle Tavern. Bookmark the permalink.